“What if?” It is a perennial question and in baseball, the “what if?” usually pertains to injury. What would have a team accomplished had not half of its players been on the DL at one point or another during a season? What if a pitcher’s promising career had not been torpedoed by a line drive off the bat of the opposing team’s infielder? Would have Larry Walker’s statistics been deemed worthy of the Hall of Fame had he not lost the equivalent of three full seasons to various injuries in his 17-year major league career? The folks from Western Canada may never have the opportunity to wave their flags on the green lawns of Cooperstown, but their pride and joy’s accomplishments on diamonds stretching from Montreal to Denver to St. Louis can never be diminished and will never be forgotten. At 17, Walker began to concentrate more on baseball. During the summer of 1984, he played with the Coquitlam Reds in Vancouver, British Columbia. He made Canada's national team and played in the 1984 World Youth Championships in Kindersley, Saskatchewan. After finishing high school, he was disenchanted about his future. "I warned Larry back then that he would have to be prepared to spend the next 50 years as a laborer," his dad, Larry Sr., the manager of a building supply company, recalled. "He said he understood that." Not long after deciding not to continue his schooling, Walker got a call from Bob Rogers, an Expo scout who realized he could sign Walker to a minor-league contract. No other teams showed interest,3 and he was signed by the Montreal Expos as a free agent on November 14, 1984, for a $1,500 signing bonus. He spent 1985 through most of 1989 in the minors in the Expos organization, batting .274 with 73 homers and 258 RBIs in 437 games. Another person in the Expos’ organization who had faith in Walker was hitting coach Ralph Rowe. After the 1985 season and for several seasons thereafter, Walker was in West Palm Beach, Florida honing his skills in the Florida Instructional League. It didn’t take long for him to show improvement. He blossomed in 1986 with the Burlington (Iowa) Expos of the Midwest League, hitting .289 with 29 home runs with 73 RBIs, before, in late July being transferred to Montreal’s other Class-A team, West Palm Beach in the Florida State League. The move was made necessary when West Palm Beach’s Mike Day, batting .316 at the time, was sidelined for the season with a broken arm.7 Walker hit four more dingers (and 16 extra base hits) in 38 games with West Palm Beach. Although he was but a 19-year-old, the folks in Canada couldn’t wait for Larry’s arrival on the big-league stage. A legion of Canadian reporters followed his every move. "Mentally, I`ve improved so much," he said, explaining his progress. "I really want to play every day, go out and do my best. I know now I can hit the ball. I have a lot of confidence even though I still strike out a lot. I swing at too many bad pitches." Manager Felipe Alou said, "If he keeps improving the way he has the last 12 months, there`s no telling what he could do. You have a kid with his kind of potential, they don`t last long in the minor leagues. "8 With Walker’s firepower, West Palm Beach won the FSL’s Southern Division. Walker spent the following season with the Class-AA Jacksonville Expos in the Southern League. After slugging 25 doubles, 7 triples, and 26 homers for Jacksonville, and being named to the Southern League All-Star team, he missed all of 1988 due to an injury, the first of several that would cut into his playing time over the years. He tore up his knee while playing winter ball in Hermosillo, Mexico. Scoring from first base on a single, he slipped on home plate and his knee locked up causing him to flip over. He needed surgery and a long rehab program. “I was told my career might end, but I never thought about the negative part of it. I was thinking positive all the time and how good I was going to be when I came back.”9 Over the course of his major league career, Walker was to miss the equivalent of more than three full seasons, spending 536 games on the disabled list. His nine trips stints on the DL allowed Walker to play in more than 140 games a season only four times during his career. The following spring, a groin injury slowed his progress even further. He was sent to the club’s minor league training facility and opened the season with Indianapolis in the Triple-A American Association. In 104 games with Indianapolis, he batted .270 with 12 homers and 57 RBIs. He also stole 36 bases. The Expos considered him ready for the big leagues, and he made his major league debut at the age of 22 on August 16, 1989, against the Giants at Montreal. The superstitious Walker favored the number “3,” and he wore uniform number 33 throughout his career. After walking in his first two plate appearances, he singled to right field off Mike LaCoss for his first major league hit. He came around to score the Expos’ first run of the game, as they went on to win 4-2. His call-up had come 10 days after Expos lost their hold on first place in the NL East after having held it since June 26. They had slipped to third place, four games behind the division leaders. They hoped that two young but talented outfielders, Walker and Marquis Grissom, would provide the spark to push them back to the top of the standings, but it wasn't to be. The Expos lost 27 of their last 43 games and dropped to fourth place. The most memorable game during Walker’s time with the Expos in 1989 was a 22-inning game at Montreal against the Dodgers—the longest in team history—on August 23. In the 16th inning of a scoreless game, Walker was called out on an appeal play for leaving third base early after scoring the apparent winning run on a sacrifice fly. But in the 18th, he made a spectacular catch of a line drive off the bat of Eddie Murray against the wall in right field, and the teams played on. The Expos lost eventually 1-0 when Dodger catcher Rick Dempsey homered to lead off the 22nd inning. Walker went 1-for-7 in the contest, and his average plummeted from .333 to .280. He ended the season in a prolonged slump during which he went 1-for-22 and saw his average drop to .170 with no home runs. In spite of the inauspicious start, Walker was not sent back to the minors. Instead he became the regular right fielder for the 1990 Expos, because Hubie Brooks became a free agent at the end of the 1989 season and signed with the Dodgers, clearing a spot in the line-up for Walker. In 1990, the Expos fielded three players with little major league experience that year: Walker, Delino DeShields, and Marquis Grissom. Walker batted .241 with 19 home runs, tying Andre Dawson’s rookie record for the Expos. His first homer came on April 20 at Shea Stadium in New York off Ron Darling as the Expos defeated the Mets 2-1. At season’s end Topps named him to its All-Star Rookie team. He didn’t hit well during spring training in 1991, and there was even talk about platooning him. After an 0-for-3 performance on May 4, his average stood at .169. And then he warmed up, going 16-for-46 with four homers over a 12-game stretch to increase his average by 79 points. But the streak was temporary. Not only wasn’t he hitting, but he sustained a pulled hamstring and wound up on the DL at the end of June. He came off the DL on July 14 and, in August, he finally found his stroke. He began the month with a 10-game hitting streak, his best of the season, during which he batted .439. From the time he came off the DL in mid-July through the end of the season, he had 10 homers, 41 RBIs, and a .338 batting average. For the season, he batted .290 in 137 games as the Expos (71-90) finished last in the NL East. In 1992, Walker hit .30l, reaching .300 for the first time, and his 23 home runs were the most of his young career. He became the first and only Canadian to win the Expos Player of the Year award. He also won the Silver Slugger award, and his 16 assists propelled him to the Gold Glove award. One of those assists came on July 4, when he fielded a ground ball in right field and threw out Padres shortstop Tony Fernandez at first base! He was named to his first All-Star team, getting a pinch-hit single in his only at-bat. And he finished fifth in the MVP voting as the Expos finished in second place, their best performance since 1981. Bringing on Felipe Alou as manager 37 games into the season was one of their keys to success. In 1993, Walker had an off-season at the plate as his average dropped to .265. However, his power numbers were consistent with those in the prior season, 22 homers and 86 RBIs. He also won his second consecutive Gold Glove Award. On a revolving door Expo team that saw 48 different players on the roster during the course of the season, he also had four fellow Canadians, Joe Siddall, Matt Stairs, Denis Boucher, and Mike Gardiner, as teammates for parts of the season. Alou, in his first full year at the helm took the team to a 94-68 record and a second-place finish. The best was yet to come. As the 1994 season wore on, the Expos were sailing along in first place, six games ahead, with Larry Walker tied for the National League lead with 44 doubles (the first of four times when he would have 40 or more doubles in a season) when the players went on strike in August. In late June that season, he had suffered a shoulder injury, tearing his rotator cuff. Although he only missed four games, the injury affected his throwing, and upon his return to the lineup he was moved to first base. The move didn’t hurt Walker's hitting: he batted .364 in 35 games at first base. At the time of the work stoppage, he was hitting a career high .322. The Expos seemed poised to be a contender for years to come with a healthy Walker at first, and Marquis Grissom and Moises Alou patrolling the outfield. It did not happen. Despite their success, the Expos suffered attendance woes. They were 11th in the league in attendance (1,276,250) and lost their top players to free agency, including Walker, who signed with the Colorado Rockies. After the financial wreckage of the 1994 strike, Expos general manager Kevin Malone was instructed to cut payroll no matter what, so the team declined even to offer Walker arbitration, meaning that they received absolutely no compensation when he signed with the Rockies. In 2002, manager Felipe Alou spoke of his team’s missed opportunity. “It’s not the sweetest thing to talk about. It took away an opportunity. I only managed that one club. That took away my only opportunity to be in the playoffs. It’s frustrating, it’s emptiness. That was it.”13 Alou, who managed in Montreal from 1992 through the first 53 games of the 2001 season, would return to managing in 2003 and get to the postseason with the Giants. Larry Walker would not have to wait that long. Although a good hitter in Montreal, in Denver’s thin air he significantly improved his statistics. He had his first 100-RBI season in 1995, and took part in postseason play for the first time as the Rockies became the first wild card team in NL history. A quartet of players collectively known as The Blake Street Bombers — Walker, Andres Galarraga, Dante Bichette, and Vinny Castilla each of whom hit more than 30 homers—anchored the team. In postseason baseball, the dictum is “good pitching beats good hitting,” and the Rockies were eliminated by the Atlanta Braves in the Division Series, three games to one. Walker went 3-for-14 with a three-run home run off Tom Glavine in the sixth inning of Game Two, won by the Braves 7-4. Walker’s 1996 season was interrupted in June when he broke his collarbone running into the outfield wall in a game against the Braves in Denver. Through his first 53 games, he was batting .283 with 14 homers and 41 RBIs and performing efficiently on the base paths, with 12 stolen bases in 13 attempts. He returned to the lineup on August 15 after missing 60 games. Less than two weeks later, however, against Cincinnati, he strained his shoulder in a collision at second base with Barry Larkin. The new injury hampered in his hitting, and over the balance of the season he only went 1-for-14. For the season, he batted .276 with only 18 home runs and 58 RBIs. Also hitting for a lofty average that season was perennial All-Star Tony Gwynn of the San Diego Padres. Although both players fell off from the July highs, they finished 1-2 in the batting race. Gwynn won the title batting .372, and Walker finished in second place at .366. Walker won the MVP Award, leading the NL with a career-high 49 homers, more than anyone in the league had hit since Andre Dawson had hit 49 for the Cubs in 1987. He also led the league in total bases with 409. His 130 RBIs were third best, as were his 46 doubles. He joined the 30-30 home run/stolen base club with his 33 stolen bases, and for the only time in his injury riddled career, had more than 200 hits, finishing with 208, second most in the league. His 108th hit of the season on June 20 against Andy Ashby of San Diego was also the 1,000th of his career. Walker had a home run spurt in mid-September, hitting dingers in four consecutive games (five homers in all) including the 200th of his career. Both it and the 199th came in a game at San Diego on September 17 and accounted for all the Colorado scoring in a loss to the Padres, 5-4. Don Baylor’s Rockies, however, were unable to fully capitalize on Walker’s contributions finishing in third place that season with an 83-79 record. And Canada would never forget Walker’s achievements. He became the all-time leader in games, at bats, hits, doubles, home runs, runs batted in, runs, stolen bases, and walks by a Canadian-born player. He is the only Canadian to reach the milestones of 2,000 hits, 300 home runs, and 1,000 RBIs, and he has paved the way for other Canadian players, such as 2004 National League Rookie-of-the-Year Jason Bay, 2006 American League MVP Justin Morneau, and 2010 National League MVP Joey Votto to slug their way to awards and recognition. During his best ever season in 1997, he played in a career-high 153 ballgames, but the injury bug struck again late in the season. He injured his right elbow swinging at a pitch just before hitting his 49th homer of the season, in his team’s 160th game, and missed the last two games of the schedule. Although he rested the elbow during the off-season, the pain persisted, and he aggravated the injury while playing golf in January. Although he tried to play through the injury when the 1998 season began, he missed several games and was on the disabled list for the last two weeks of June. Despite his injury, he was batting .331 in July and was chosen as an All-Star game starter. “I don’t deserve to start the game,” Walker humbly proclaimed. “I probably don’t even deserve to be on the team. But the fans get their say, and I’m fortunate enough to be one of the three (National League) All-Star outfielders. I accept it as a great honor.”18 Although injuries forced him to the sidelines during the second half of the 1998 season, when in the lineup, Walker was a force to be reckoned with. He raised his average to .363 and won his first National League batting title. He had surgery during the off-season. He started the 1999 season on the DL with a strained rib cage and missed the first week of the season. When he returned to the lineup, he got off to a slow start, going 7-for-31. After some advice from hitting coach Clint Hurdle on April 28, he had three homers and eight RBIs in St. Louis as the Rockies defeated the Cardinals 9-7. His batting average jumped that day from .235 to .308, and he was on his way to another strong year at the plate, winning his second of four batting titles with a .379 batting average. He was named to his third All-Star team in as many seasons and also corralled his third consecutive Gold Glove. In 2002, the Rockies got off to their franchise-worst ever start, 6-16, and manager Buddy Bell was released on April 16. Clint Hurdle replaced him, and although the team showed some immediate improvement, winning the first six games under Hurdle’s stewardship, they stumbled after June 1, notwithstanding another good year from Walker. Walker’s season peaked in June and July as he raised his average from .310 to a season’s high of .368. However, the team fared far worse, going 19-33 during this stretch en route to a 73-89 fourth-place finish, 25 games behind the division winners. Walker batted .338 with 26 home runs, and a team-leading 40 doubles. The frustration of having been to the post-season only once in his career nagged at Walker. “It’d be nice to get back,” he said at one point in the season. “It’d be nice to see that plastic in here again [covering lockers in the Rockies’ clubhouse] and champagne flying all over the place and take another crack at it.”22 He would at least do it with improved eyesight. Shortly after the season, Walker, who had been wearing contact lenses, opted for Lasik surgery. Trade rumors swirled during the off-season; a deal with the Diamondbacks for Matt Williams fell through because Williams did not wish to be apart from his family and Walker balked at deferring part of his salary. The celebration, for Larry Walker, was still on hold. For the first time since 1996, Walker hit below .300 (.284) in 2003. He played through knee and shoulder injuries, getting into 143 games with 16 homers and 79 RBIs. The knee injury resulted from a collision with Rockies center fielder Preston Wilson during a 1-0 loss at Pittsburgh on August 2. Manager Hurdle noted, “Even with the injuries and the lack of numbers from what they used to be in the past, Larry is still pitched to very carefully and fearfully throughout the league. He’s played beaten up and bruised. He’s done what he could do.”23 The Rockies continued to drift low in the standings, pretty much duplicating the 2002 season, finishing fourth with a 74-88 record. Walker never missed more than three consecutive games during the course of this season. But besides his regular knee and shoulder ailments, he was bedeviled off and on by hamstring, groin, and hip problems. Before he came to the Cardinals, he had been on the disabled list a total of eight times during his career, but a healthy Larry Walker could help secure a post-season berth for St. Louis. In 44 games with the Cardinals, he batted .280 with 11 homers. The Cardinals won 105 games that season to win the National League’s Central Division. Walker excelled in post-season play. In the Divisional Series, he batted .333 with two home runs in four games as the Cardinals eliminated the Dodgers, three games to one. He smacked two more homers in the NLCS as the Cardinals defeated Houston in seven games. It was then on to the World Series for the first, and only, time in Walker’s career. Although the Cards were swept by the Red Sox, Walker had a good series, batting .357 with two homers, the only home runs St. Louis hit in the four games. He returned to the Cardinals in 2005 and showed that he could still hit at the age of 38, batting .289 and adding the last 15 of his 383 career home run total. However, he could not elude the injury bug and was bothered by a neck injury that put him on the DL one last time. He retired after the 2005 season. Walker finished his 17-year career with a .313 batting average, 2,160 hits, and 1,355 runs scored. His .565 slugging percentage stands 12th on the all-time list as of the end of the 2017 season. He benefited from the mile-high atmosphere of Coors Field, batting .384/.464/.715 there compared with .280/.385/.514 on the road in the same seasons. More honors followed: Walker was inducted into the Canadian Baseball Hall of Fame and Museum in 2009. He is a record nine-time winner of that Hall of Fame’s Tip O’Neill Award presented to the top Canadian baseball player of the year. Larry was also inducted into Canada's Sports Hall of Fame in 2007 and the British Columbia Sports Hall of Fame in 2009. Walker has been married twice. He married Christa Vandenbrink on November 3, 1990, and they had a daughter, Brittany Marie, born on July 15, 1993. The day after the 1998 All-Star game Walker married Angela Brekken. They have two daughters, Canaan and Shayna, and live in West Palm Beach, Florida. An updated version of this biography appears in "Major League Baseball A Mile High: The First Quarter Century of the Colorado Rockies" (SABR, 2018), edited by Bill Nowlin and Paul T. Parker. DeMarco, Tony, Larry Walker, Canadian Rocky, (Sports Publishing, Inc., 1999). Gallagher, Danny, "Walker the best position player ever from Canada" in Remembering the Montreal Expos, (Toronto, ON, Scoop Press, 2005): 209-212. McDonald, Ian “Expos Decide Their ‘Future’ is Now,” The Sporting News, May 7, 1990. 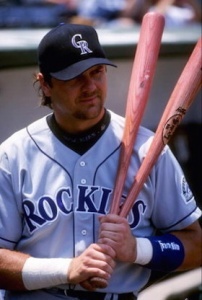 Mossman, John, “Life is Good for Rockies’ Slugger,” Times-Daily (Florence, AL), July 16, 1997. Walker’s file at the Baseball Hall of Fame Library. 1 Bob Hill, “Le Naturel Larry Walker is No Ordinary Class-A Prospect. He’s Aiming to be the First Canadian Born Player to Make It Big in Montreal,” Sun-Sentinel (Fort Lauderdale, FL), August 10, 1986, 5C. 2 Tony DeMarco, Larry Walker, (Philadelphia, Chelsea House Publishers, 1999), 19. 3 Marty York, “Expos’ Walker Could be Superstar,” Denver Post, April 11, 1993, 3B. 4 Leigh Montville, “The Accidental Ballplayer: Larry Walker Always Dreamed of Playing in Montreal — For a Hockey Team,” Sports Illustrated, April 5, 1993. 5 Tony DeMarco, Larry Walker, (Philadelphia, Chelsea House Publishers, 1999), 27. 6 Montville, Sports illustrated, April 5, 1993. 7 Hill, Sun-Sentinel, July 27, 1986, 6C. 19 Bill James, “The New Bill James Historical Baseball Abstract (New York, Free Press, 2001), 825. 24 Tom Timmerman, “Walker’s Childhood Dream Melts into Another Form,” St. Louis-Post Dispatch, October 24, 2004.